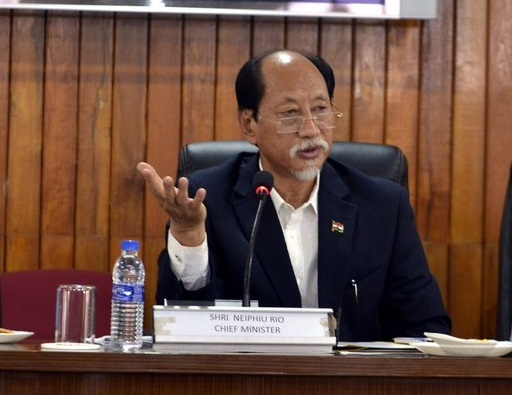 Nagaland Chief Minister Neiphiu Rio said on Thursday that the National Investigation Agency (NIA) was only doing its job referring to the on-going investigation into alleged terror funding in the State during the T R Zeliang regime. While interacting with the media on the side-lines of a felicitation programme held in his honour at Chiephobozou in Kohima the Chief Minister said though he was unaware of what the Zeliang Ministry had done, he would look into the entire issue. It may be recalled that the Confederation of All Nagaland State Services Employees’ Association (CANSSEA) had demanded suspension of the probes against the backdrop of summons and arrests of some government officials over alleged payment of illegal taxation to Naga National Political Groups (NNPGs). FOOTBALL ACADEMY: Rio also informed the media persons that he would be laying the foundation stone for the Dr T Ao Football Academy at Seithekema in the month of April itself. The Chief Minister further added that during his previous tenure as Chief Minister, the state government had acquired land at Seithekima for construction of the Dr T Ao Football Academy. He also said Rs 90 lakh was also released for the purpose. He went on to state that after he had left for new Delhi, the previous government shifted the academy to Niuland, but that the proposal could not get through. Rio also disclosed that since North Eastern Council (NEC) has given around Rs 13 crore and another Rs 15 crore by Tata Trust, the project would now be carried out. AIR AMBULANCE: The Chief Minister also disclosed that a private firm from Australia, as part of its Corporate Social Responsibility (CSR), was willing to provide an air ambulance for the interior areas of Nagaland for free, provided the villagers agree to part with 500 meters of land for construction of a runway.